Gift boxes and baskets of specialty and gourmet grocery and home items are a fantastic way to say “Thank You” to someone special, or give a gift of gratitude that comes from the heart and speaks to the stomach! Anyone that is a foodie or food lover will appreciate receiving gift boxes of these types of items. You can walk into numerous big box retailers and department stores today and find entire sections devoted to delicious and new food items. No need to purchase these overpriced items that are mass produced. Gifts that are fresh and from locally sourced companies are a much better choice as everyone these days loves buying local and supporting farms, agriculture and “slow foods”. Check out our holiday sausage and cheese gift boxes that are chock full of goodness. More and more people are finding value in giving a gift that means something to the recipient. A gift that shows that they’ve thought about the person and their wants and likes. The thought matters a great deal! Giving holiday cheese baskets and other gift boxes of gourmet goodies to someone that loves assorted handmade cheeses is one fantastic way to actively show that you care. Ashe County Cheese company is a small niche, cheese making factory that offers holiday sausage and cheese gift boxes for sale at affordable prices. We ship our boxes anywhere in the United States. Our most popular holiday sausage and cheese boxes are the Blue Ridge Supreme boxes because they contain so much and you can literally customize every option. Our holiday sausage and cheese gift boxes are a great way to say more than just, “I care about you”. It shows that you know what the recipient loves, or will love (if they’ve never tried our cheese) and its a fantastic way to buy locally sourced food items. 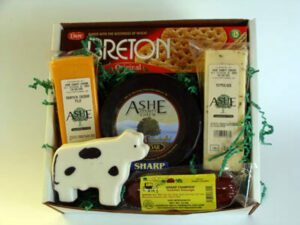 What Holidays are Perfect for Sending our Holiday Cheese Baskets? Where to Buy Cheese Curds?